Home Features	The 3rd Annual Southeast Game Exchange Will be Bigger & Better Than Ever. See What’s in Store for Attendees in Our Interview with Event Creator, Austin Bell. 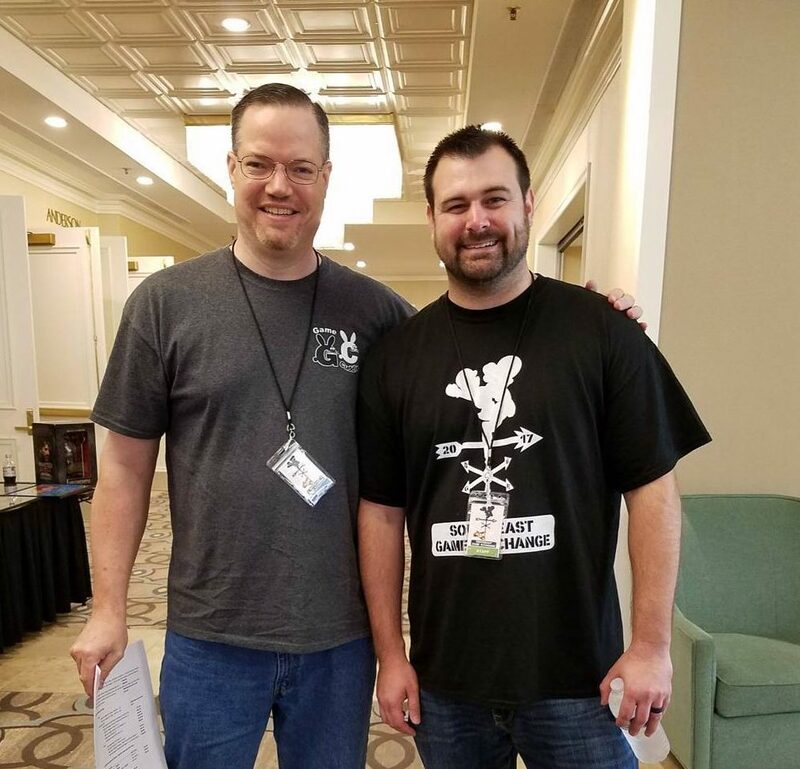 We had the privilege last year of attending the Southeast Game Exchange in Greenville, SC, and were quite amazed at what we saw and did. There were lively competitions, intriguing panels, cool cosplays, and tons of vendors ready to sell & trade their games, systems, and accessories. For 2018, event creator, Austin Bell decided to expand upon the event’s offerings from the previous 2 years. This time, making the SEGE a two day long extravaganza in an even larger sized facility! We decided to talk to Austin about the changes he’s making this year and what attendees can expect. Here’s a look at what this year’s exciting event will have to offer. For those who’ve never attended the Southeast Game Exchange, can you give a brief explanation of what the event is? The Southeast Game Exchange is a TWO DAY celebration of all things related to video games! There will be vendors, free-play video games, tournaments, an art workshop, door prizes, a cosplay contest, and special guest panels both days! From retro gaming to the new generation, there is something for all ages at this family friendly convention. It looks like you have some big plans this year to expand the size and length of the event. Can you tell us how you’re growing the event and why you felt the need to make these changes? We are excited to announce that we are doubling our venue space AND adding a second day to the event! Last year we filled up so quickly that we, unfortunately, had to turn away vendors. We also had a lot of feedback from attendees that, while they were pleased with the amount of vendors, the size of the previous venue caused some foot traffic problems, which made it difficult to see what everyone had to offer. You had about 40 vendors last year. How many are you planning for this year? We will have over 70 vendor tables this year. Some repeat vendors as well as some that are new to the SEGE. What types of vendors will be attending? Our preference is that the majority of each vendor’s table be video game related. But that definitely doesn’t limit what you will find at our event. You will see a variety of items such as game related figurines, plush toys, and collectables, retro and new video games and consoles, art prints and crafts, as well as other video game oddities. Do you still have openings for vendors? If so, how does someone become a vendor? We have a very limited number of spaces remaining. Anyone that is interested in becoming a vendor should to reach out to us as soon as possible to ensure their spot! We can be reached via our Facebook page, Instagram, or the official website! Last year, you had several exciting gaming competitions which included titles such as ARMS & Super Mario Bros 3. Can you tell us what types of competitions attendees will be able to participate in this year? We have already announced Fortnite Battle Royale, Overwatch, and Rocket League as some of our tournaments this year. We will also have a special SEGE Pokémon Challenge. Pokémon Sun and Moon or Ultra Sun and Ultra Moon players and fanatics should bring their game and system with them this year to participate in the challenge. We will be announcing more retro and new game tournaments on our Facebook page and website in the upcoming months. Can we expect one-of-a-kind trophies and prize packages again? Any cash prizes? Oh, definitely! We are already working on our trophies for this year. We are also busy collecting donations for prize packages and door prizes. There will also be a cash prize for the Fortnite Battle Royale, Overwatch, and Rocket League tournaments. Will you be hosting a cosplay contest again this year? If so, can you give us some details on that? One of the standouts of last year’s SEGE was the wide variety of interesting panels & special guests. Besides AvantGeek, who else do you have planned for this year? This year we have even more YouTubers, speedrunners and cosplayers as special guests as well as a well know voice actor that has voiced many AAA title games, and a couple of Pokémon Professors. We are also adding something new to the event, an art workshop led by a South Carolina artist that will allow attendees to create and take home an original video game related piece of art. You can check out the Special Guests tab on our website to get all the details. One of the things that makes the SEGE different from a comicon is its focus on gaming and the fact that attendees can buy, sell, or trade game related items at the event. Can any game, system, or gaming accessory be brought by attendees to sell or trade? Absolutely. Many vendors will be accepting trades. They are excited to see what our attendees bring and are willing to make deals. Do you have any tips for people who want to bring items to sell or trade? Yes, make sure you clean everything up as well as you can, and remember to find the power cords! We recommend not bringing more than can fit in a backpack. Are there any special rules individuals need to abide by when selling/trading? No reproduction cartridges are allowed unless they are clearly marked. It looks like you have a lot of new sponsors this year. Are you still looking for more? We are always looking for sponsors! We definitely could not make this event bigger and better each year without the continued support from our sponsors. We ask that all our attendees show their love for the SEGE by not only supporting us, but by supporting our sponsors as well. What types of sponsors are you looking for? We have primarily stayed within the video game industry with our sponsors. However, if a company outside the industry is interested in sponsoring, we are always up to exploring the opportunity! It is really easy! Email us at Southeastgameexchange@gmail.com or reach out via our Facebook page and we will message you back with information and details on being a sponsor. Currently, we are a family run convention. Most of our day-of volunteers are close family and friends. We believe this has been helpful in creating the intimate family feel of our convention. However, we are always looking for special skilled individuals to make this convention even bigger and better! What types of tasks do you need people for? We are open to all ideas! We would love to talk to anyone who has a special skill they think could help make this convention even more of a success. Whether that means you are good with video or photography, have a knack for graphic art, social media or websites, interested in creative writing, or even an idea we might not have thought of yet, we would love to hear from you! You can reach out to us via email at Southeastgameexchange@gmail.com or through our Facebook page! What’s your best advice on how to make the most of the event? Come EARLY and plan on coming BOTH DAYS! Last year we had a pretty big line prior to opening so you definitely want to get there early. We have worked out a way to streamline the ticketing process and cut down on the wait time of our guests, so guests are not waiting long, which means that they don’t miss out on those gems that will surely be snatched up by the early arrivers! (Tickets are available at Eventbrite.com). We are also working tirelessly to have a variety of things for everyone to do on both days. There will be different panels, tournaments, free play games, and activities for each day, so you won’t want to miss out! What is your advice for collectors when it comes to finding/obtaining that rare gem? Have a list of items that you are looking for and put those items into tiers by level of want versus need. Also, know your current inventory so you don’t buy duplicates. (There are great apps available to help with this). And lastly but not least, just because you don’t see it on the table, doesn’t mean our vendors don’t have some insider knowledge or know how to get you that one game you’re looking for. It never hurts to ask. Is there anything else you want people to know about the event? Did you know we do giveaways all year long on Facebook? YEP! We get the fun started on Facebook before the event and if you follow the page, you get the insider scoop on tournaments we will be having! Follow and keep watching our Facebook page for announcements and giveaways. Tell us something personal about yourself that you’d like to share. I am a small-town guy that found his love for video games at a very young age playing DuckTales 2 on my mom’s original Nintendo. It wasn’t until a couple years ago that I found an old box in my mom’s attic of video games and a console, and DuckTales 2. I realized that although years had gone by, the love for retro games and consoles was still there. I am pretty consumed with Fortnite Battle Royale on the PlayStation 4 right now. I really like the squad mode because I am not the best player, but that’s what’s fun about the game! A player that is brand new and elite players, all start with just a pick axe, making it a level playing field for all competitors. I like playing with better players. I feel like it makes me better. Thanks so much to Austin for taking the time to answer our questions! We’re counting down the days to the big event! (And, we hope you can sneak away to play some Fortnite)! The 2018 SEGE will take place on August 18th-19th at the Greenville, SC, Shrine Club. If you live out of town, you can book a room at the Hilton Greenville for a special SEGE attendee rate. Tickets can be purchased at Eventbrite.com.